Gaining credibility on the international scene in places like Paris, London or New York can boost a Mideast designer’s standing closer to home. In part, it plays to the so-called khawaga complex, or foreigners’ complex in Arabic. It’s the feeling for many here that Western brands, especially when it comes to luxury goods, are superior to homegrown ones. But endeavors such as Ms. Fahmy’s also suggest that more Mideast designers are starting to win attention abroad. For Ms. Fahmy, selling her handcrafted necklaces, rings and earrings in the West is part dream and part savvy marketing tactic, aimed at tapping the wider Middle East’s big-spending clientele. Flush with petrodollars, the region has become a fast-growing market for high-end goods. “You are targeting the elite who already buy Bulgari and Cartier,” she says. 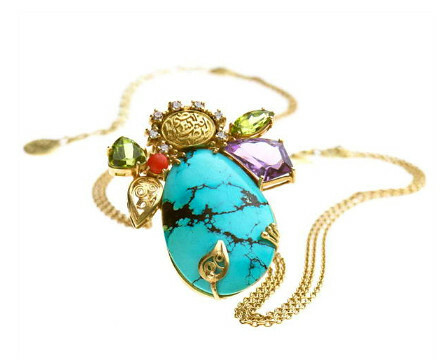 Palestinian designer Dima Rashid has had her jewelry — incorporating brightly colored semiprecious stones and traditional motifs such as the evil eye — featured on the cover of the British edition of Vogue and displayed in upscale stores from Harvey Nichols in England to Barneys in the U.S. More recently, she started selling her work in Jordan and Dubai. Neither Ms. Hourani nor Ms. Rashid had planned her excursion to Europe as a marketing ploy, but success there has boosted their profiles locally. 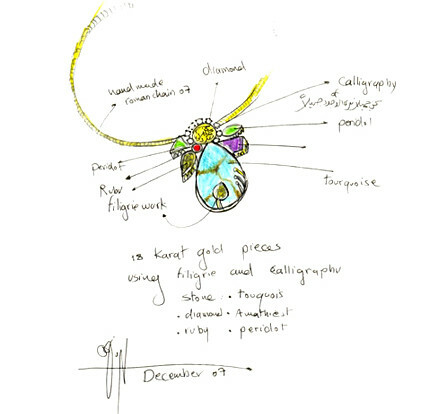 Jordanian designer Nadia Dajani has showcased her jewelry pieces, which include semiprecious stones and Arabic calligraphy, in exhibitions in the U.S., England and Spain. She had an exhibit in Paris this month. In the fashion world, Lebanese designer Elie Saab’s name is familiar to many in the West, including celebrities. His work is also a beacon of elegance for many in the Mideast. Mr. Saab opened a showroom in Paris in 2000. He now plans to open stores in New York and London. “I am proud that my most expensive [line], the haute couture, is made in Lebanon,” he says. Ms. Fahmy got started after coming across a German book about European jewelry from the Middle Ages. It was 1969. She didn’t read German, and the book cost her monthly salary as a government-employed book illustrator. She bought it anyway. Inspired, she became an apprentice under a master silversmith in the bustling Khan el-Khalili market in Cairo, where vendors hawk traditional crafts. She couldn’t afford to quit her government job, so she went to the market after work and stayed until midnight, the only woman at the workshop, she says. She started off filing down metal, slowly soaking up the trade before she was allowed to design her own pieces. Her first sale was five silver rings. Ms. Fahmy opened her own workshop with just one employee in a rundown Cairo neighborhood. Her style evolved into what later became her hallmark: turning Arabic words and poetry into intricate calligraphy inscribed on silver and inlaid with gold to adorn her pieces. In 2002, she opened a factory on the outskirts of Cairo. Today, it has more than 180 employees. Men and women bend over long wooden tables as they drill holes in bangles or pound with small hammers to set stones. About a year later, she branched out into the United Arab Emirates, but the move wasn’t easy. “She was quite a success story in Egypt, but around the Arab world not many people were aware” of the Azza Fahmy brand, says Fahed Ghanim, who was the general manager for jewelry and watches at Al Tayer Insignia at the time Azza Fahmy Jewellery came to the UAE. Al Tayer holds franchise rights in the UAE for such brands as Bulgari and Boucheron as well as for Azza Fahmy Jewellery. When an Azza Fahmy Jewellery store opened in the high-end Emirates Towers shopping mall in Dubai, lined with European designers’ boutiques, some fashion-watchers were skeptical, questioning how it would do against Europe’s top brands. Ms. Fahmy’s pieces — now ranging from $240 to $40,000 — seemed too expensive for a local designer. The shop is still there. To broaden her appeal, Ms. Fahmy researched the British market for two years, and last year approached Mr. Macdonald, the British fashion designer, who has previously worked for Chanel and Givenchy. He was familiar with her work because a friend owned some of her pieces. He came to Cairo for a few days, where he saw more of her jewelry, toured her factory and exchanged ideas on designs. One recommendation: no Arabic inscriptions. He wasn’t sure Western women would want to wear them around their necks. The two agreed to collaborate on a collection. It featured oversize pieces with intricate patterns and geometric shapes made out of gold and silver and studded with diamonds and onyx. The designs were showcased during London Fashion Week earlier this year. The two are now working on their second collection, due out in time for February’s London show. “It’s got so much craft in it,” says Mr. Macdonald of Ms. Fahmy’s work. “There’s a passion.” Ms. Fahmy would like to one day see her jewelry in showrooms in the U.S. and plans to offer pieces online there next year.